Yet Ferguson chose to focus not on the more violent aspects of conquest but rather the slow but complete acceptance of Christianity by the proudly heathen Vikings. 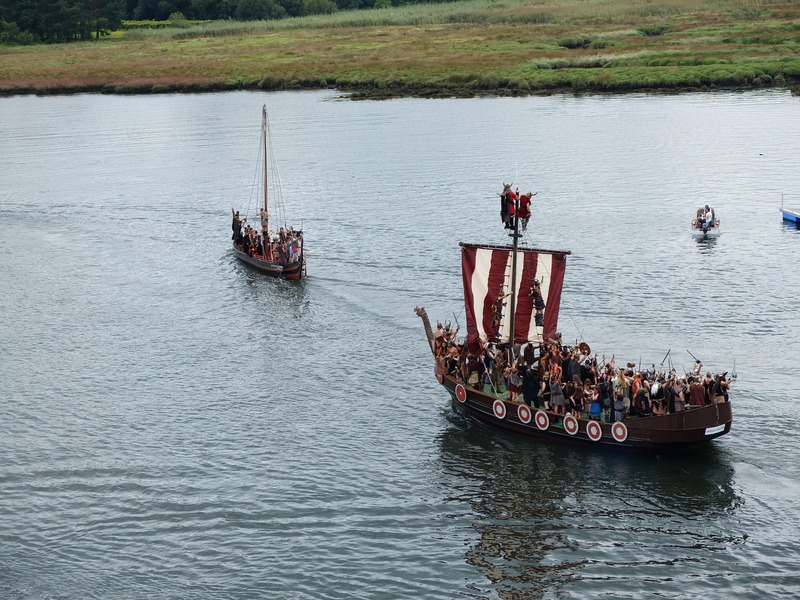 He contrasted elaborate Viking funerals–in which the family buried patriarchs and occasionally matriarchs on a ship built on or perhaps dragged onto dry land and filled with weapons, armor, knick-knacks and the odd slave–into later Christian burials. Ferguson explained how heavy-drinking Vikings had a lot of trouble accepting the self-denial of a religion that still had dozens of fast days. They managed to continue eating horsemeat, often to the dismay of Christians in the rest of Europe. From their very first incursion against Charlemagne, the Vikings received many entreaties to accept the cross. In fact, Charlemagne’s successors often bribed Viking chiefs with gold to convert. Several did. Not understanding religion in the way that monotheists typically do, the Vikings sloughed off their new Christian identities as quickly as they could doff their new white vestments. Yet the pressure to become Christian continued, both from states threatened by the Vikings and, eventually, from converts within the Viking population. During that time, Viking chiefs and later kings accepted Christianity and re-embraced their traditional religion; charged their subjects to convert, punished them for observing heathen rites and asked them to change back. Their successors fought each other and used religion–both the new and the old–as a rallying cry. Yet their modern-day descendants, the Scandinavians (save Finland), consider themselves overwhelmingly Christian according to the CIA World Factbook. While I don’t endorse swords or bribes as a means to drive culture change, I do believe that the long Viking road to Damascus (figuratively, although they did in fact have coins from Syria) should inform any marketer who has accepted the mandate for culture change. Whether trying to drive change in one’s own firm or a client’s, it behooves you to settle in for the long haul. Cynicism about religion aside, at least some of the people advocating the Viking’s acceptance of Jesus burned with zeal. They meant it. They believed their way meant earthly righteousness and eternal salvation. They saw the Vikings as unenlightened souls who simply needed to hear The Word to achieve greater consciousness. Yet the pull of tradition, the stories of Odin and Thor and the taste of horseflesh remained strong. It took a good 350 years to convert the last holdouts. Ferguson offers no insight into what made the last raider put down his hammer and pick up a cross. It took time, constant reminders of Christianity’s merits, bribes and occasional threats. As you encourage your stakeholders to embrace a new way of thinking about your business, think about what it might take to convince that last holdout. Please don’t use swords, however.